We had a good turn out of councilors and residents with even the youngest showing there picking skills with approx 15 people taking part. Collectively we filled 20 bags of rubbish!!!!! Depressingly, a very large quantity from Row of Ashes and New Road towards the junctions with A38. We know that many residents regularly collect rubbish they come across while walking through the village and this definitely helps to keep the rubbish levels down, however, we will continue to arrange 2 or 3 organised litter picks through the year to tackle the rubbish in the more busy routes through the Parish. Thank you to everyone who came along today and that do their bit throughout the year to help keep Butcombe clean and tidy. North Somerset Council are 6 weeks into there 2036 Local Plan Consultation. Click on the attached link below to view there most recent poster and contact details. Jonathan Weeks appeared with a large number of medieval musical instruments at our Medieval Feast on October 19th at Butcombe Village Hall. The guests were treated to delicious game pie and mead, and many came in fancy dress. There was a raffle with high value prizes, and the Woodland Trust charity received a £500 donation from the proceeds of the evening. 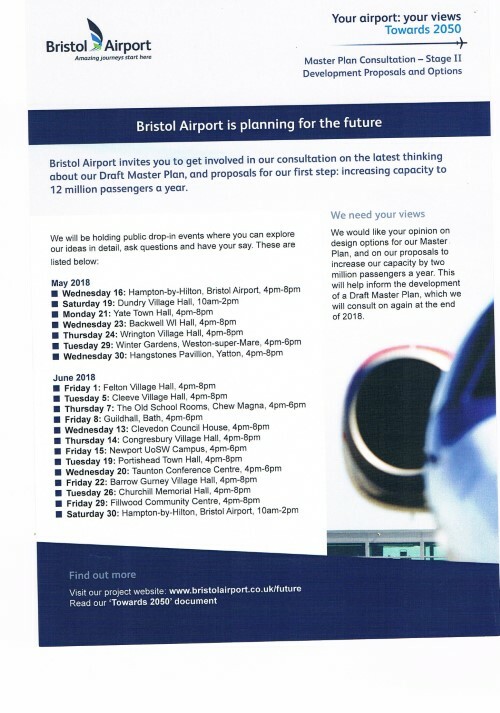 Bristol Airport has launched a Stage II consultation to help prepare its strategic Master Plan for long term airport expansion up to possibly 20 million passengers per year by the 2040s. The consultation also includes a more immediate proposal for a planning application for expansion to accommodate 12 million passengers a year to be submitted to North Somerset Council this autumn. In 2017, the Airport achieved 8 million passengers per year. Only 1,750 people responded to the Airport’s first consultation last winter. Given the enormous change to transport infrastructure and the local landscape that such expansion of the Airport is likely to entail, it is critically important that everyone makes their views heard, whatever they may be. The deadline for consultation responses is 6 July 2018 and they can be made online or by calling the Airport for a consultation form on 0800 915 9892. There are also a number of public drop-in events being held in local villages until June 30th – click here for more information or call the Airport on the above number for details. The village Litter Pick on Sunday 25 March 2018 saw many residents come out and help to clear up litter that has accumulated around the village over the past few months. Nearly all of Butcombe and quite a bit of Nempnett Thrubwell was walked and 15 bags were collected, most of them pretty full. 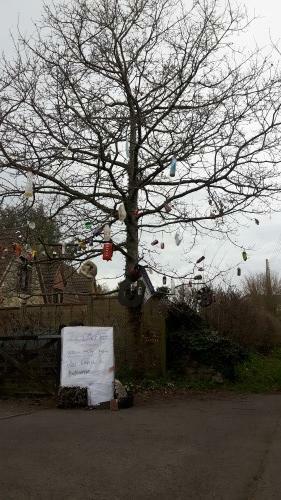 Councillor Justin Milward has created a display "The Litter Tree" showing some of the litter collected.